Full Tilt Poker Already Pulled from Market? 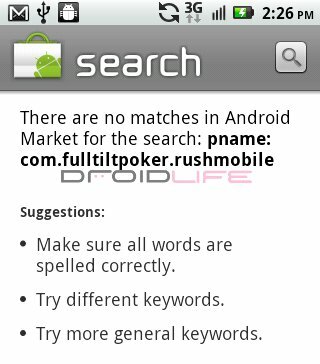 We wrote about the release of Full Tilt Poker onto the Android market just 4 days ago over at Android Life and it appears as if it has already been removed. You can search for “Full Tilt Poker” in both the market and on App Brain and you will likely come up empty. We even used the QR code from our post the other day and were welcomed to the screenshot above. It’s anyone’s guess as to why it would be removed, but the fact that it’s the first “real money” poker app for Android could be a big part of why it is no longer available. Many users also complained about it being like a Flash game essentially just running in a browser, so maybe the overall experience wasn’t up to Full Tilt standards? I think we’re going with reason #1. I should point out that I still have the app installed on my Droid X and it appears to work as it did from day 1. We’ve reached out to Full Tilt to find out why and will report back as we have something. Black Friday Poll: Buy Anything Good Today? Full Tilt Poker on Android Pulled "Due to Maintenance"